Photography as a valid member of the Fine Arts has always been problematic. What is there is there which means that the nuance and encapsulated time compression of Painting doesn’t hold the energy of a masterpiece or if it does, not in the same way. Photography is nonetheless a thrilling medium capable of both the outlandish and the sublime. 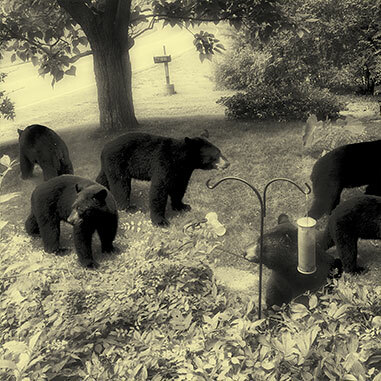 The recent visit to my yard by a Bear set off ideas and potential events. I was trying to get the feel of a Bruegel. This huge fellow visited my front lawn on Tuesday morning around nine. 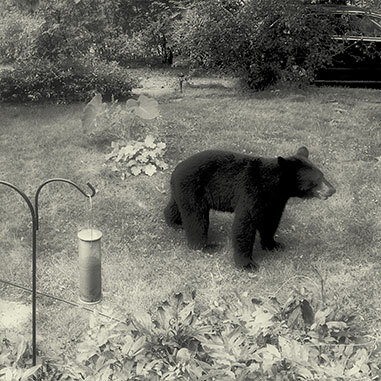 He was only interested in bird seed and decimated the feeders. I was sitting on the back porch steps when he arrived in his black-hole black, a darkness I have never seen on an animal before and his huge brown snout. What good luck to see him so close! After thirty minutes of looking around he wandered away.